The eggs are coming thick and fast from our females here, and we’ve also caught a lot more pregnant females from the wild. Yesterday Mr Osgood managed to catch five in an impressively short amount of time. That man is VERY good at catching iguanas. He is also hilarious. Whilst trekking through the jungle there’s no better sounds than his laughter booming out through the trees. The road to Rock Harbour is swampy and bad at the moment so to get there we had to walk through Iron Bound and cross an estuary. Mr Osgood pointed to below his waist and said that the water would come up to that far. This was a lie. The water came up to well above my chest. It all felt very Amazonian and explorer-like. Rosa, who is a small girl, had to be piggy backed across by her boyfriend or her feet wouldn’t have touched the ground . Mr Osgood found this all quite amusing. After this crossing we had no qualms about wading into the sea when we arrived at the beach fully clothed for a swim. It is a spectacularly beautiful place. Classic postcard picture; white sand fringed with palms, turquoise still ocean etc etc . .
A troubled note now, the tarantula problem here at the station has gotten pretty bad. ~ by iguana123 on April 19, 2011. 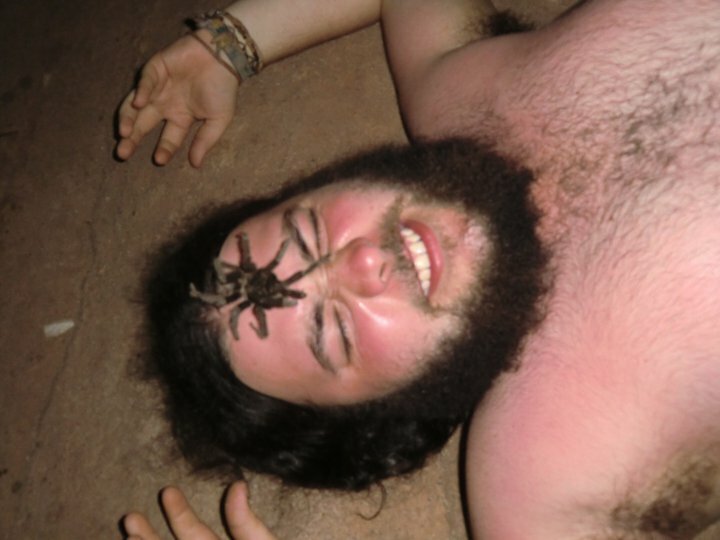 A sidebar note: the Honduran Curly-hair Tarantula, Brachypelma albopilosa, is the friendliest of all tarantulas. Although it may bite if ever to be poked around with a stick or petted (?) strenously, the chances of hospitalization are minimum. They are kind, funny to the touch, giving and almost everlasting -they can live past the 20 years mark. Yes, sorry, we didn´t mean to be scaring people……..
Oh I love the scary part, it gives the story a bit of edge. What truly is scary is the ghost of the little kid that hangs out by the bookshelf in the hallway on the second floor.